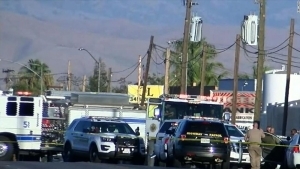 BAKERSFIELD (KMJ/AP) — The man alleged to have killed five people, before turning the gun on himself, has been identified by Kern County Sheriff’s Office. Sheriff Donny Youngblood says Javier Casarez used a .50 caliber handgun in the shootings, which started after 5pm Wednesday at a trucking business near Manwell Boulevard and Highway 58. A company employee, 50 year old Antonio Valdez, was the first victim. The suspect’s wife, 45 year old Petra Caserez, was the second victim. “A third gentleman was there and he fled,” detailed Sheriff Youngblood. The Sheriff’s Office said that Casarez then went to another home and killed 31 year old Laura Garcia and her father, 57 year old Elisio Garcia. The suspect then allegedly stole a car, before shooting himself when confronted by a deputy. Investigators have been looking at the ongoing divorce between Javier Casarez and Petra Casarez to figure out a motive for the incident. “She had filed for a change order in the proceedings very recently, child support and property,” revealed Sheriff Youngblood.